Frog Hair FC is the latest advancement in fluorocarbon. Unlike other fluorocarbons, which behave 'wiry' and stiff, Frog Hair FC is processed with GAMMA's exclusive technology, resulting in the most supple and elastic fluorocarbon on the market. Now add in the superior refractive qualities of fluorocarbon and imagine the results! Frog Hair FC is the latest advancement in fluorocarbon. Unlike other fluorocarbons, which behave &apos;wiry&apos; and stiff, Frog Hair FC is processed with GAMMA&apos;s exclusive technology, resulting in the most supple and elastic fluorocarbon on the market. Now add in the superior refractive qualities of fluorocarbon and imagine the results! Frog Hair FC is truly your competitive new advantage in both fresh and salt water. Frog Hair FC is an ultra high molecular weight PVDF fluorocarbon made using GAMMA&apos;s exclusive processing technology. 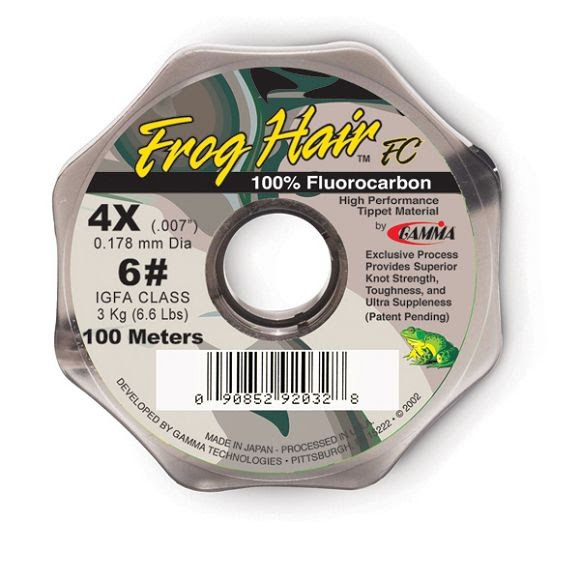 Unlike other fluorocarbon monofilaments that are very rigid and stiff, Frog Hair FC is processed to increase the flexibility of the material and provide up to two times the suppleness of other typical fluorocarbon monofilaments. The added suppleness compliments the refractive qualities of fluorocarbon to deliver the most stealthy, natural presentation possible and increase your catch rate. In addition, GAMMA&apos;s process increases the Shock Resistance of the material to help prevent untimely break-offs resulting from aggressive strikes. The built-in Shock Resistance also provides greater fighting capability and enable you to land more and bigger, world class fish than you could with other leading fluorocarbon materials. Gamma Technologies&apos; ability to build a better product is accomplished by the willingness to differentiate, and our philosophy to engineer products from the ground up. This results in superior performance and added value for the user. The bottom line is that the fisherman no longer has to compromise on the most important piece of his or her equipment. Enjoy!